It’s been a couple months since our last project update. We’ve just uploaded a ton of new titles for you. These include a few major newspapers, like the Indianapolis News; a few “niche” titles from the Indiana Socialist press; and a plethora of small-town journals dating from 1804 up to the 1960s — some with colorful titles, but one of which may have the most boring title of any newspaper in American history. (We hope that makes us famous.) Scroll down to see what it is. At the end of July, Hoosier State Chronicles had brought 362,926 pages online. Ten weeks later, we now have 541,618 — an increase of 49%. . . with another 100,000+ to be added in a fortnight. Check out our additions over the last two months. And enjoy. Indianapolis News (1869-1920, 8584 issues), digitized in cooperation with IUPUI. The gaps in issues will be filled in with the next upload or two. Does your local library, historical society, or genealogy club want to digitize your Indiana community’s newspapers? Does the prospect seem overwhelming? Or perhaps you just don’t know where to start. If so, have no worries! The Indiana State Library staff would be happy to talk to you individually or present a public program about newspaper digitization best practices, and how the State Library could help. If interested contact Chandler or Connie. Their contact info can be found at http://www.in.gov/library/ldo.htm . My colleague, Connie, and I recently visited the Northwest Indiana Times in Munster (formerly Lake County Times, and Hammond Times) to discuss our newspaper digitization efforts, and to answer some of their questions about digitizing their newspaper. You can read about our visit here: Indiana working to digitize historic newspapers : Munster Community News. Crowd-source Your Favorite Indiana Newspapers! We are excited to blog that the Newspaper button on Indiana Memory is LIVE! Clicking on the button will take you to all of the newspapers we have digitized as part of the National Digital Newspaper Program plus a few more. The content is being displayed in Veridian software, which is really exciting because users like you can correct the Optical Character Recognition (OCR) text. If you researched with any digitized content in the past, you may have discovered that the search results you received were often only as good as the OCR. The crowd-sourcing component of Veridian allows you to register and make corrections to the OCR. For instance, if you find an individual’s name garbled in the OCR, you can correct it yourself, so that future users can find that person’s name in the newspapers easier. The Library of Congress recently ingested another 12,533 pages of Indiana newspapers into Chronicling America! This brings the total number of Indiana newspaper pages in ChronAm to over 80,000! The Indiana State Library staff are digitizing these newspapers as part of the National Digital Newspaper Program. A few years ago the Indiana State Library awarded a grant from the U.S. Institute of Museum and Library Services to the Putnam County Public Library, DePauw University Libraries and the Greencastle Banner Graphic to digitize Greencastle newspapers. The organizations launched their archive of Greencastle newspapers in May 2012. Unfortunately, those newspapers have been inaccessible the last few months because of some server issues. The good news is that they recently migrated most of the content to the Private Academic Library Network of Indiana’s (PALNI) Digital Collections, and the content can now be accessed here. AUGUST 2015 UPDATE: We are in the process of migrating the Greencastle content from the PALNI digital collections into Hoosier State Chronicles. We should have most of the issues migrated by the end of 2015. When it is done there will be around 14,450 issues, and nearly a hundred years worth of Greencastle newspapers from 1880-1979. We will give updates on newly migrated Greencastle content in future blog entries (so be sure to subscribe to our blog, or follow us on Twitter @HS_Chronicles ), or you can just click through and find an up-to-date list here. San Francisco Call, March 14, 1901. Chronicling America. 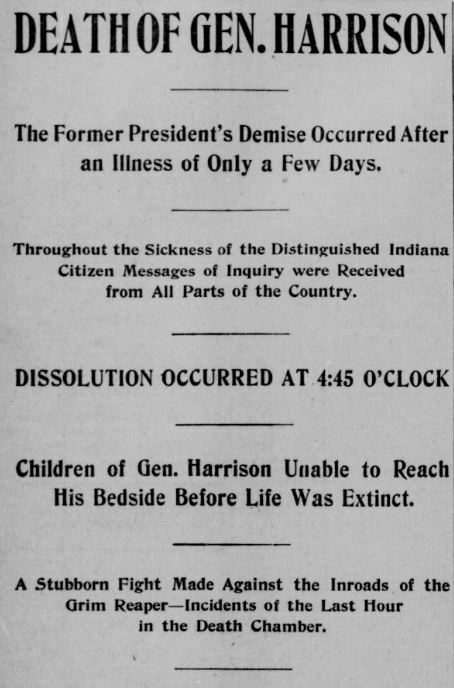 Indianapolis Journal, March 14, 1901. Chronicling America. Lew Wallace – New York Daily Tribune – February 16 1905 – Chronicling America. 109 years ago tomorrow, in 1905, Indiana author, soldier, and statesman Lew Wallace died. Wallace was born on April 10, 1827 in Brookville, Indiana. 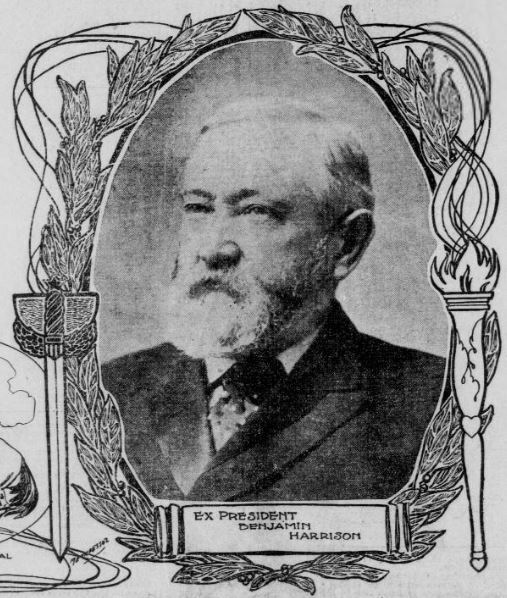 His father, David, was a future governor of Indiana, and his mother, Esther, was the daughter of a three-term Congressman. Wallace spent his youth in Covington, Crawfordsville, Indianapolis, and Centerville. He enlisted in an Indiana regiment at 19 years old and served in the Mexican-American War. After the war, he began a law practice, won election as prosecuting attorney for Indiana’s first district, married (Susan Elston), had a son (Henry Lane Wallace), and served in the Indiana Senate. He moved to Crawfordsville after the birth of his son, and maintained a permanent residence there the rest of his life. At the outbreak of the Civil War, Governor Morton commissioned Wallace as adjutant general to recruit and organize Indiana’s quota of troops. Wallace subsequently became colonel of the 11th Indiana Volunteer Infantry. He rose through the ranks, and became a major-general by 1862. He participated in the battles of Fort Donelson, Shiloh, and Monocacy. He also administered the Middle Department and 8th Army Corps in Maryland and Delaware. He subsequently sat on the court-martials of Abraham Lincoln’s assassins and Henry Wirtz. New York Daily Tribune, February 16, 1905. Chronicling America. 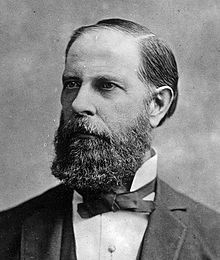 After the war, he served as Governor of the New Mexico Territory from 1878-1881, and U.S. Minister to Turkey from 1881-1885. He also began a literary career with his first novel, The Fair God, published in 1873. He followed his debut novel with Ben-Hur: A Tale of the Christ in 1880, which became one of the best-selling novels of the 19th century. “A High Tribute to General Lew Wallace,” Pensacola [FL] Journal. “Career Over for Gen. Lew Wallace,” Washington [DC] Times. “Death Summons General Wallace,” Minneapolis Journal. “General Lew Wallace,” Bourbon [Paris, KY] News. 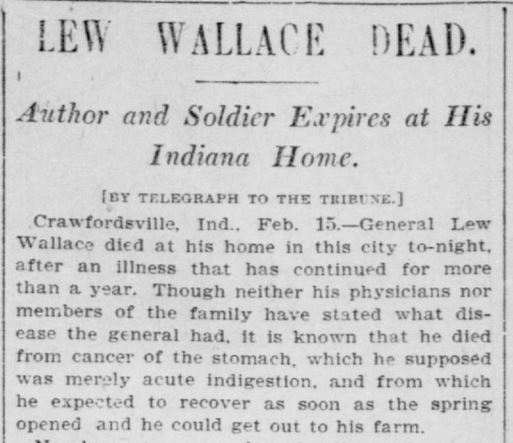 “General Lew Wallace Dead at Crawfordsville, Ind., Home,” Rice Belt Journal [Welsh, LA]. “General Wallace Dead,” Alexandria [VA] Gazette. “Gen. Lew Wallace Dead,” Brownsville [TX] Daily Herald. “Gen. 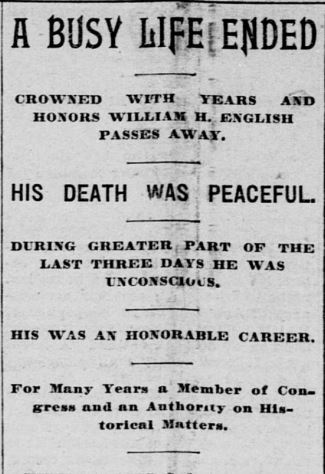 Wallace Dead,” Washington [DC] Evening Star. “Great Man Passes Away,” Tazewell [VA] Republican. “Lew Wallace,” Salt Lake Tribune. 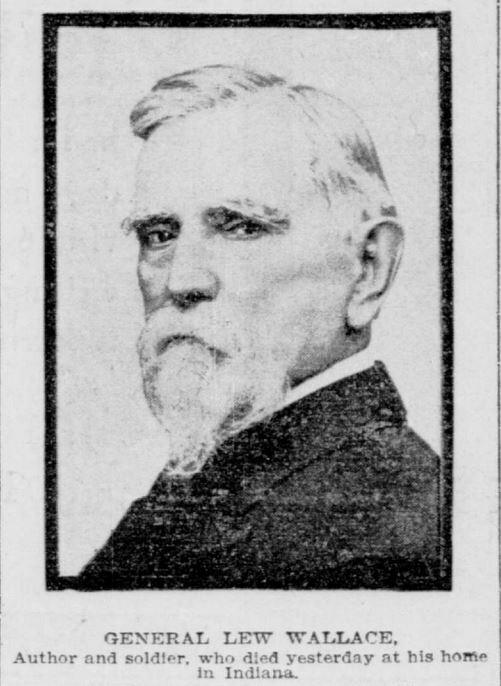 “Lew Wallace Dead,” Bennington [VT] Evening Banner. “Lew Wallace Dead Stanch [sic] Friend of West End Came Quietly,” Bisbee [AZ] Daily Review. “Noted Author of “Ben Hur” Dead,” Los Angeles Herald. William Hayden English. Wiki Commons. 118 years ago today in 1896, William Hayden English died. English was a notable Hoosier politician, businessman, and author. English was born in Lexington, Scott County, Indiana on August 27, 1822. During his twenties, he worked in local and state politics, and held a federal appointment in DC. He won election to Congress in 1852 as a Democrat, and served in the House from 1853-1861. He is most remembered in his congressional career for authoring the controversial compromise measure known as the English Bill. In an attempt to politically resolve the violence in “Bleeding Kansas,” English’s bill offered federal lands to Kansans if they would ratify the pro-slavery, Lecompton constitution. Kansas voters rejected this compromise. Shenandoah (PA) Evening Herald, February 8 1896. Chronicling America. St. Paul Daily Globe, February 8, 1896. Chronicling America. English chose not to run for re-election in 1860, and returned to Indiana. He settled in Indianapolis, and engaged in banking. Although a Democrat, he did support the policies of Morton and Lincoln during the Civil War. English re-emerged as a political candidate in 1880, when the Democratic National Convention nominated him as candidate for Vice President of the United States. Democratic Presidential nominee Winfield Scott Hancock, and English narrowly lost the election to James A. Garfield. English had an incredible personal fortune, and financed the construction of two Indianapolis landmarks in the 1880s. The famous English Hotel, and English’s Opera House. San Francisco Call, February 8, 1896. Chronicling America. You can read more contemporary accounts about English in Chronicling America. Including checking out some of his obituaries linked in this post. 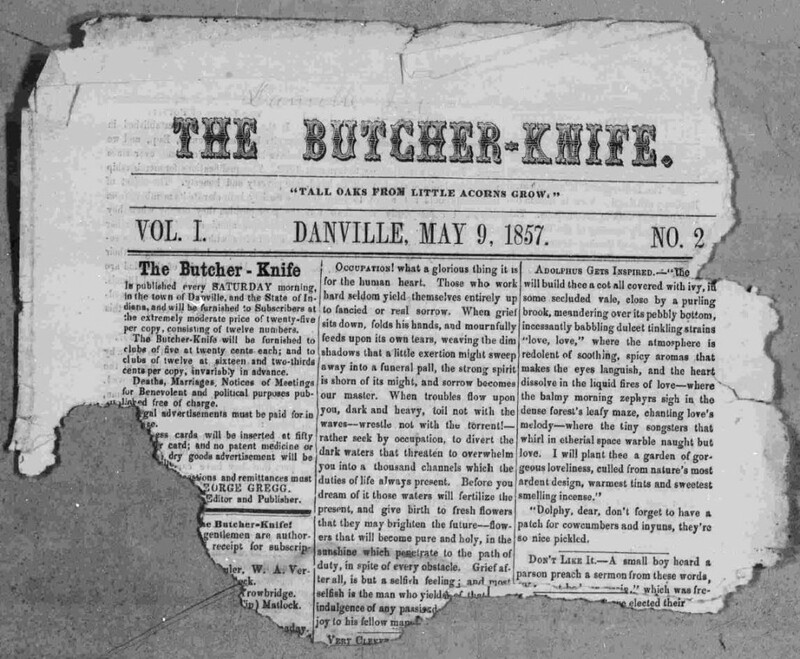 Brookville American, 1858-1860; Indiana American, 1853-1857; Indiana State Sentinel (weekly edition), 1875-78, 82-89, 92-94; and more issues of the Wabash Express, 1860-1861. If you are a regular user of Indiana newspapers on Chronicling America, you may notice that several Plymouth newspapers have disappeared from the site. Those newspapers have been temporarily purged, but they should be restored within a week. These additions will bring the total number of Indiana newspaper pages on Chronicling America to over 70,000. Happy searching!